Discover campsites of East France but also over 450 campsites throughout France, offering a variety of rental mobile homes, chalets and accommodation of more atypical as bungalows or caravans, but also leisure facilities such as aquatic areas with sometimes an indoor or well even with heated pool for your comfort, for an unforgettable vacation. Campsites in East de France welcome you to your camping holiday 2, 3, 4 and 5 star or LRP. 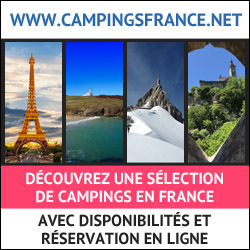 Campsites with recreational facilities (swimming pool, water park, water park, water slides, wading pool, spa, playground, tennis court, multi-sports), entertainment and services (restaurant, bar, food, WiFi access, disabled access, camper services) to make the best of holidays throughout East de France. Traditional camping in East de France on pitches or rental of mobile home camping, campsites below offer the best camping in East de France. Enjoy the outdoor accommodation and campsites in East de France! Rental of mobile homes, chalets, bungalows, cottages, Bengali, cottages, trailers, caravans, tipis and camping sites equipped for your holidays in East de France, our French campgrounds welcome you everywhere in East de France, a favorite camping in Europe. Have a great holiday camping with our campsites in East de France! Camping 4 stars in the Hauts de France, the campsite' Château du Gandspette' in the Pas-de-Calais, is a campsite with a wooded park of 11 ha. We are ideally located 30 minutes from Calais and Dunkerque. The campsite is equipped with an aquatic area with two swimming pools, one of which is heated, a bar-restaurant and a multi-sports ground, tennis court. We offer mobile home rentals and pitches for your stay in tents, caravans or camper vans. Near vestiges of the Second World War. Close to the site of the two capes, classified as a major national site of France (35km). Welcome to our campside *** the campside Caravaning des 4 vents” located in Crèvecoeur-en-Brie, quiet little village in the Brie region, department of Seine-et-Marne (77) - Ile de France (Paris region)Next Disneyland Paris . Conveniently located around 15 minutes drive from Disneyland Paris.RER E station at 10 minutes drive in the town of Tournan en Brie you could go direct to Paris center easily. Outside swimming pool. Just 20 km from Paris and Disneyland Paris, 40 km from Parc Astérix, Camping LE PARC DE PARIS offers you hospitality in a wooded area, all year round. Indoor heated swimming pool from 01/04 to 31/10 , playground fitted out for children, tennis, ping pong, minigolf, sports ground, bowls grounds, bicycle rental, internet access in WIFI, in high season children club, entertainment (disco, karaoke, darts, …). 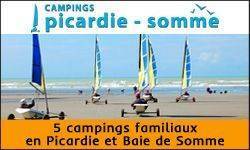 The campsite is a meadow of 9 hectares planted with trees, situated at 3 kms from a sandy beach, the belle dune golf course, from Aquaclub the watersport center and an equestrian club, a few km from the Somme Bay and Crecy forest ; at 10 kms from Rue train station. A comfortable,4-star campsite situated in the heart of the Baie de Somme and next to the lovely Medieval Village of Saint-Valery-sur-Somme. You will discover several villages with fishing beaches, beautiful cliff and woodlands walks. Campsite facilities include an outdoor heated swimming pool, tennis court, a comfortable Snack-Bar and a children’s play area. There are lots of entertainments, Kid’s Club during the high season. Our Camping " Le Bois De Pins" is installed on a meadow with 5 acres near the resort Cayeux Sur Mer, in a small city of Brighton. In proximity of a beach sand and rollers, with dunes and wood pines, discover one the beautiful bay in he world, " La Baie De Somme". 10 km far away from Disneyland, 30 km from Astérix Parc and close to Paris, in a 450 ha parc, we are offering you to stay in our campsite wich has all the facilities of that type of establishment. We rent pitches for tent, touring caravan and campers. We also rent mobilhomes. Situated in a leisure parc, you will be able to do all sort of sport activities. Nearby, you will found Provins, Fontainebleau, Versailles where you will spend unforgettable moments.